Your weekly call to post brought to you by the damn cold weather. I did absolutely nothing this weekend outside of my apt because it's been really fookin cold since the beginning of last week and no one in my neighborhood shovels their sidewalks. Even though I'm originally from SoCal I can usually deal with the cold pretty well. 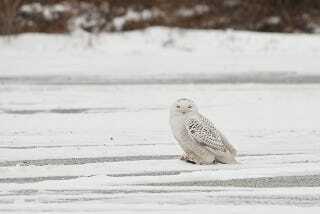 Anyhow, here's a picture of a snowy owl in Brooklyn. Reply here if you are still looking for posting rights. We'll consult the weather fluctuations. You can reach us at odeckmod@gmail.com.